A dogasaurus, a stinkbug and a rainbow bear are jostling at the starting line as the countdown begins for this year’s Children’s Book Council of Australia (CBCA) Book of the Year Awards. The CBCA today announced the Notables List which includes well-known authors such as Alison Lester and Morris Gleitzman as well as first-time finalists like 15-year-old Siena Stubbs from North West Arnhem Land. “The CBCA Book of the Year Awards were first presented in 1946 and this year has a record 488 entries, demonstrating the good health of Australian children’s literature,” CBCA National Chair Professor Margot Hillel OAM said. “The 2019 entries reflect the incredible diversity of lives in our society. This was particularly evident in the Early Childhood category, with stories about characters with disabilities, and with different ethnicities and family structures. “Many of the Older Reader books dealt with contemporary issues. This year’s Notables List has also recognised an unusually wide range of genres including science fiction, historical novels, dystopian fiction, murder mysteries and urban fairytales in the Older Reader category. Regarded as Australia’s most prestigious children’s literature award, the CBCA Book of the Year is presented in six categories: Older Readers, Younger Readers, Early Childhood, Picture Books, Eve Pownall Award and CBCA Award for New Illustrator (formerly Crichton Award). 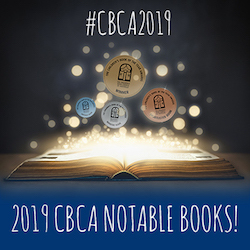 The full list of 2019 CBCA Notables is available here. The 2019 Short List will be announced on 26 March, with the winners announced on 16 August – also the launch date for CBCA Children’s Book Week with this year’s theme “Reading is my secret power”.